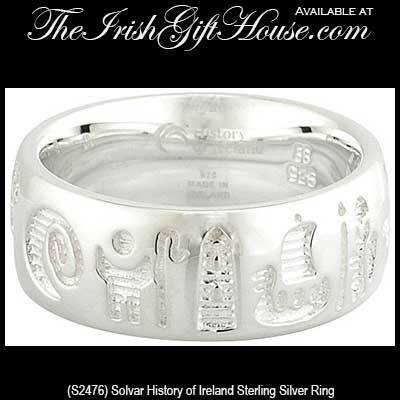 The sterling silver History of Ireland ring is 8mm wide and it is available in sizes 5 to 14 including half sizes. The History of Ireland band is a unisex design and it is gift boxed with the legend booklet that explains the symbolism. 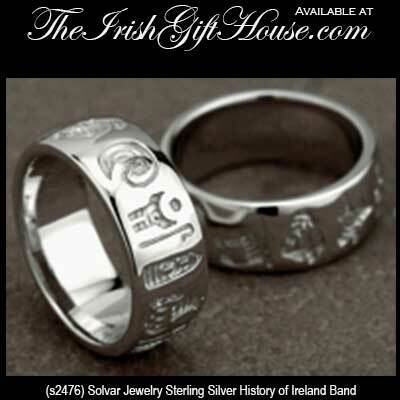 The History of Ireland jewelry is made in Dublin, Ireland by Solvar Jewelry; it is available at The Irish Gift House. History of Ireland men's ring features a sterling silver band that measures 10mm wide.